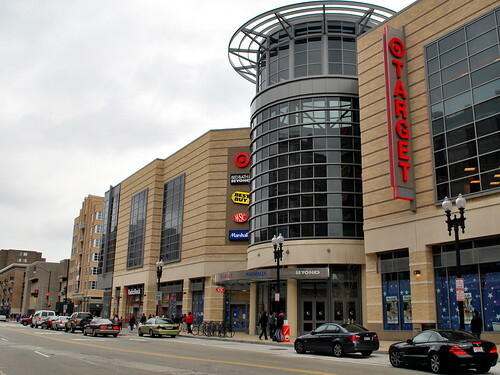 Outside the Columbia Heights Target, in a neighborhood of century-old rowhouses, there are mixed opinions about this contemporary attempt at an urban big-box. Some people love the energy that the new businesses have created. 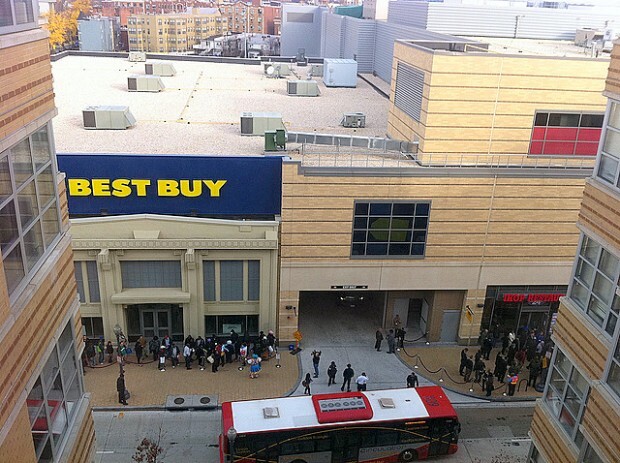 This picture was taken at 9am this morning, when people were already in line for free pancakes from the new IHOP in DCUSA. There were jugglers, clowns, balloon artists and what looked like a giant, stuffed pancake strolling down Irving street, entertaining the crowd, who started chanting “Pancake, pancake!” during the opening ceremony, which featured members of the City Council and Mayor Adrian Fenty. Council Chair-elect Kwame Brown tweeted this amazing photograph of the Mayor, Council member Jim Graham and himself wearing blue IHOP cardigans. What a festive way to start the day, in Columbia Heights. The sign in the window at DCUSA, with the "opening" date covered in tape. Earlier today, I posted about Councilmember Jim Graham and Ellwood Thompson’s not being on the same page with regards to DCUSA; Graham just called me and he’s not backing down from what he told Lydia DePillis over at the City Paper. 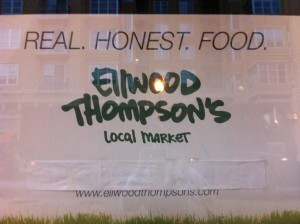 But the owner of Ellwood Thompson’s, Richard Hood, told TBD that “I don’t know why Jim Graham is saying this. We are not in default. We continue to work with the landlord to make this happen”. Graham responded: “That does not comport with the information that I have from DCUSA ownership. If they’re continuing to try and work it out then that’s fine, but I’m going on the information that I have. I have been very involved in this. I have asked continuously what’s going on. Jim Graham and Ellwood Thompson: Not on the same page. According to Councilmember Jim Graham, the Richmond-based organic food store recently ended its two-year flirtation with the DCUSA location–and will lose about a million dollars in breaking its agreements. 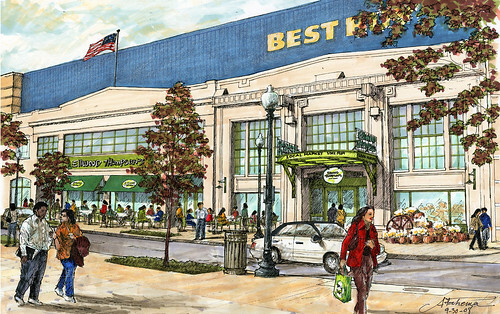 Richmond-based organic grocer Ellwood Thompson’s has not abandoned its plans to open a store at the DCUSA retail complex in Columbia Heights, according to company owner Richard Hood…”I don’t know why Jim Graham is saying this. We are not in default. We continue to work with the landlord to make this happen,” Hood said. I called my Councilmember, Jim Graham and emailed two of his staffers to find out more but his office has not responded to my inquiries. Like many of my neighbors, I felt relief earlier today, when it seemed like this never-ending saga finally had a (any!) resolution. I should’ve realized that when it comes to Ellwood Thompson’s and DCUSA, any pronouncement should be taken with a lot of salt– if only I had a grocery store on my block, from which to buy it. 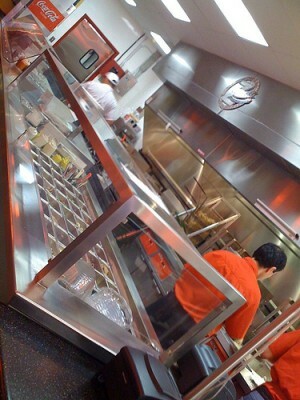 Z Burger in Glover Park. I live in Columbia Heights. I end up at DCUSA, or what I call the “vertical strip mall“, almost daily. I was overjoyed that the Target within it expanded their grocery section because I avoid the Giant supermarket near 14th and Park unless it’s an emergency; the last time I was there, it was during a blizzard and the infamously-long lines stretched to the back of the store– and then wrapped around it. …in Columbia Heights. 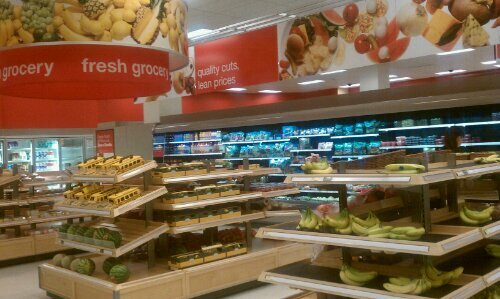 They had everything from individually-wrapped baking potatoes to Target-brand Naan-bread. I wasn’t sure what to expect (I shop at this Target weekly, if not more frequently) but I was surprised by the items they now carried. Other shoppers were discussing how the prices measured up to Giant and Trader Joe’s. I saw juices and two-bite brownies like the ones sold at Whole Foods. It feels like an ambitious effort. 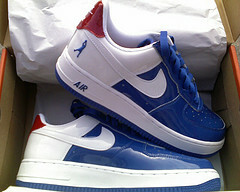 Sheeds/Air Force 1s. SportsZone is known for sneakers. I’ve just learned that the newest tenant coming to DC USA will be a SportsZone. They are a sports and apparel company with locations in MD, VA and DC. 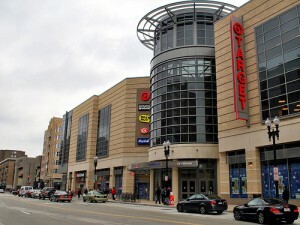 They’ll be located between the Lane Bryant and Staples on the 14th St, NW side. They are looking to open by the end of Nov.